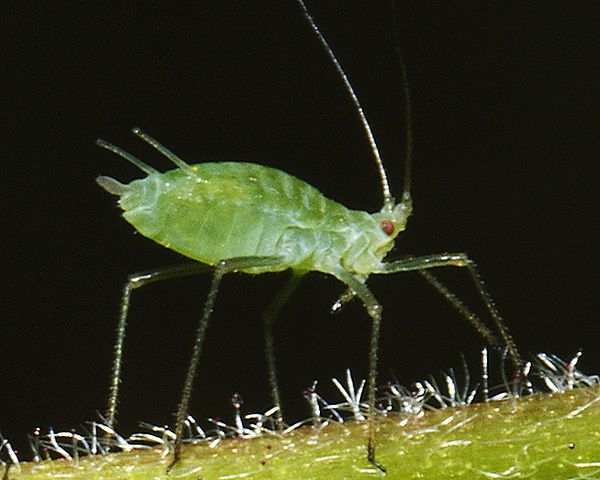 Acyrthosiphon aphids are rather large broadly spindle-shaped, short-haired aphids with long antennae, legs, siphunculi and cauda. 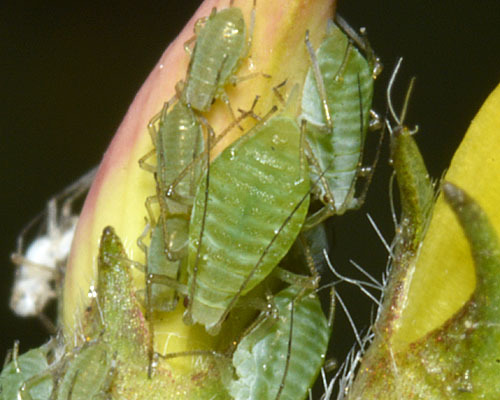 Acyrthosiphon aphids are usually green but sometimes brownish, pink, or yellow. There are sometimes small marginal tubercles on abdominal segments II-IV and small spinal tubercles on the head. The antennal tubercles are well developed, usually smooth with diverging inner sides. The median frontal tubercle is very small or absent. The antennae are about as long as the body or longer. 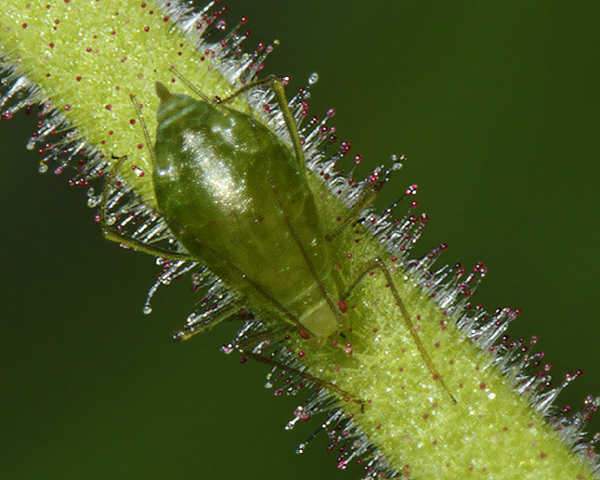 Apterae have secondary rhinaria near the base of antennal segment III; alates have more rhinaria on III. The siphunculi are cylindrical or tapering, occasionally with 1-3 rows of hexagonal cells below the distinct flange. The cauda is tongue- or finger-shaped, often slightly constricted. This is a genus of about 80 species worldwide living without host alternation on various dicotyledons, particularly Fabaceae, Rosaceae, and Euphorbiaceae. 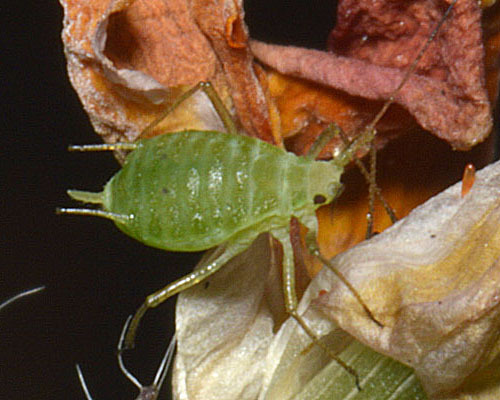 Adult apterae of Acyrthosiphon boreale are green with the anterior part of the body yellowish. Their antennal tubercles are well developed with diverging, rough inner sides. The antennae are 0.7-1.1 the body length and the terminal process is 4.6- 6.0 times longer than the base of the sixth antennal segment. 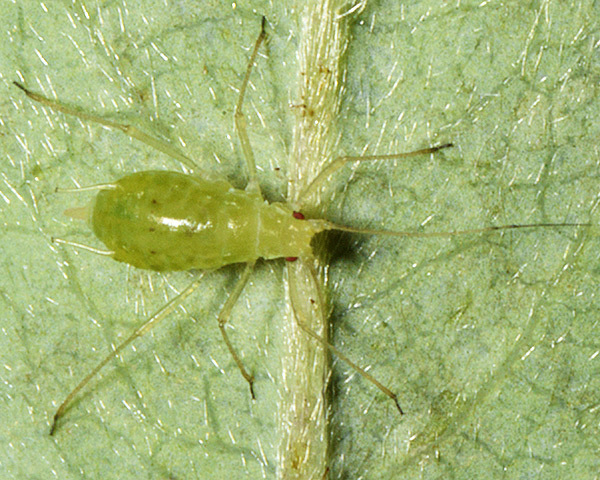 The third antennal segment of the aptera has 2-14 (rarely less than 5) slightly raised secondary rhinaria mainly on the basal half.The dorsal cuticle is slightly sclerotized and wrinkled, but not pigmented. The siphunculi are cylindrical with a rather well developed flange. The siphunculi are 0.21-0.30 times the body length and 1.5-2.6 times longer than the cauda. The cauda is rather thick, not constricted and bearing 7-11 hairs. The fundatrix is similar to the aptera, but the terminal process is only 2.7 times longer than the base of the sixth antennal segment. Males are apterous. Acyrthosiphon boreale lives year round on cinquefoils (Potentilla) species. It has a boreo-alpine distribution including northern Europe, Greenland and Canada. Apterae of Acyrthosiphon loti are green, or rarely pink, often with indistinct greyish transverse stripes. Their antennae have dark apices, but the individual antennal segments do not have dark apices. The antennae are 0.9-1.0 times the body length, and the antennal terminal process is 3.2-4.0 times longer than the base. The antennal tubercles of Acyrthosiphon loti are low and smooth and strongly diverging. The median frontal tubercle is low and flat. Acyrthosiphon loti siphunculi are dark tipped and are 1.2-1.6 times the caudal length. The siphuncular diameter at the midpoint is 1.0-1.4 times the diameter of the hind tibia at its midpoint. The body length of Acyrthosiphon loti is 1.7 to 2.9 mm. Acyrthosiphon malvae apterae are green, yellowish or greyish green, or pinkish red, The femora and siphunculi are pale. The terminal process of antennal segment VI is 4.8-5.8 times the length of its base. The longest hair on antennal segment III is 0.7-1.0 times the diameter of that segment and the apterae have 1-24 secondary rhinaria on that segment. The fused apical rostral segments are 1.1-1.4 times the second hind tarsal segment. Their siphunculi have no polygonal reticulation, are cylindrical on the distal half and are 1.8-2.2 times the pale caudal length. The body length is 1.5-3.2 mm. Acyrthosiphon malvae alatae have 12-31 secondary rhinaria on antennal segment III. Acyrthosiphon malvae is found on many plants, but particularly herbaceous Rosaceae. There are many subspecies, mostly with specific host-plant associations. Acyrthosiphon malvae sensu stricto are pale green or red aphids on many Geraniaceae and Malvaceae worldwide, as well as plants in other families. Acyrthosiphon malvae subspecies agrimoniae is yellowish green and found in flowerheads or on undersides of leaves of Agrimonia species (agrimony) in Europe and western Asia. Acyrthosiphon malvae subspecies poterii is bright salmon pink, yellowish or green and found on Poterium sanguisorba (= Sanguisorba minor) (salad burnet), and is only known from England. Acyrthosiphon malvae subspecies potha Börner is pale yellowish or greyish green and associated with Alchemilla species (lady's mantle) throughout Europe. Acyrthosiphon malvae subspecies rogersii (Theobald) is green or yellow-green, often shiny, and may form large colonies on young leaves of Fragaria (strawberry) in north and west Europe (Blackman & Eastop 2006). 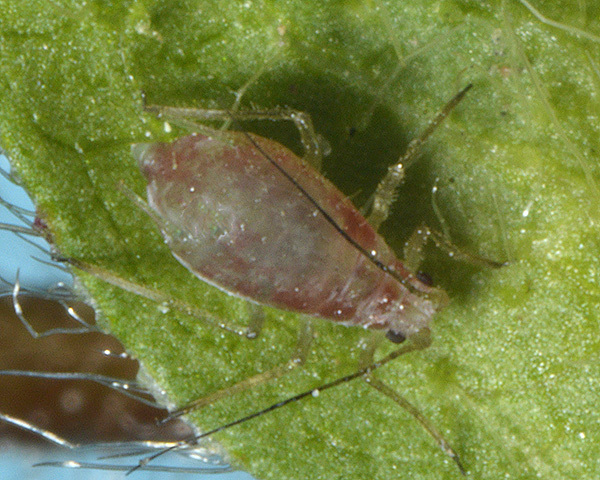 The geranium aphid does not host alternate. All subspecies spend their entire life cycles on their respective host plants, overwintering in the egg stage. Acyrthosiphon pisum apterae are pale green or pink with red eyes. The antennae of Acyrthosiphon pisum are 1.0-1.6 times as long as the body. The antennal segments, tibiae and siphunculi have dark apices (cf. Acyrthosiphon loti which does not have the antennal joints darkened). The siphunculi are tapering and very thin with the diameter of a siphunculus in the middle less than the diameter of the hind tibia; the siphunculi are 1.2-1.9 times the length of the cauda. The cauda is long and tapered. 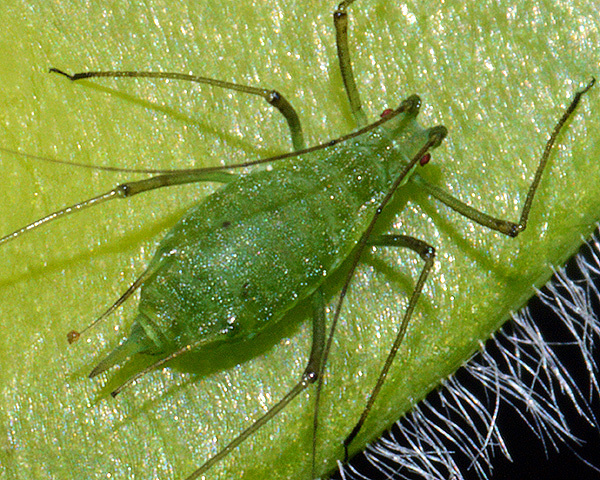 The body length of Acyrthosiphon pisum apterae ranges from 2.2 to 5.0 mm long. The alate viviparous female has the head and thorax only slightly darker than the abdomen which is pale with small marginal sclerites. 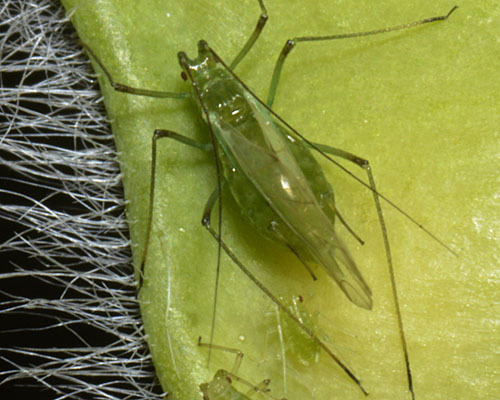 The pea aphid can be found feeding on about 20 genera in the family Fabaceae but especially on Medicago, Melilotus, Trifolium, Dorycnium and Lotus. Acyrthosiphon pisum is a major pest of peas and alfalfa, partly because of direct feeding damage and partly because of virus transmission. Adults readily fall to the ground if the plant is disturbed. 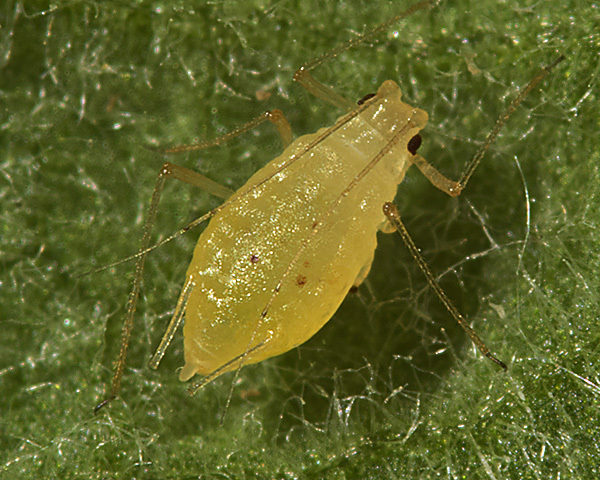 The pea aphid is found worldwide in temperate climates. 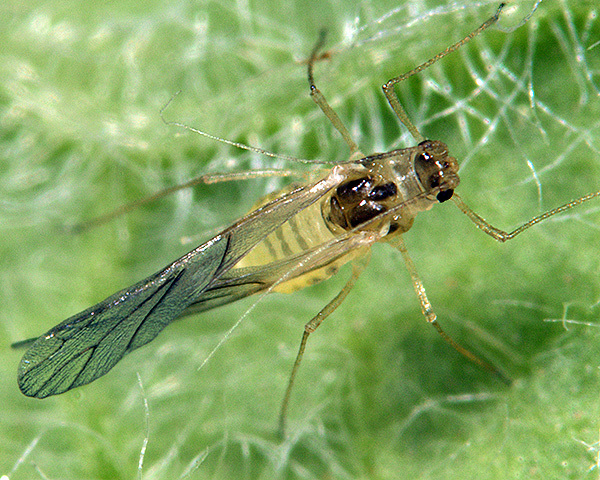 Adult apterae of Acyrthosiphon primulae (see first picture below) are shiny pale yellow to greenish yellow. They have dark tips to the antennae and legs, but not to the siphunculi which are entirely pale. The median frontal tubercle is slightly developed. The siphunculi are 2.2-3.1 times longer than the cauda. The cauda of Acyrthosiphon primulae is 1.3-1.6 times longer than the base of antennal segment 6 (cf. Acyrthosiphon malvae which has the cauda 1.8-2.6 times longer than the base of antennal segment 6).